Bison | Beer Apprentice - Craft Beer News, Reviews, Interviews and Info. Hi guys. 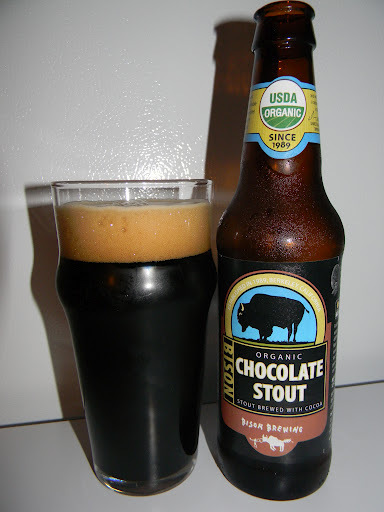 For today’s craft beer review I’m going to be trying the Bison Organic Chocolate Stout produced by Bison Brewing Company located in Berkeley, California. I’ve only had the opportunity to try a couple of Bison beers, so I don’t really know that much about them. Let’s check on the website, bisonbrew.com, and see what we can find out about the Chocolate Stout. Bison’s Chocolate Stout is a medium-bodied ale characterized by rich cocoa and roasted malt aromas, charismatic flavors of dark chocolate and espresso, a creamy mouthfeel and smooth, dry finish. This brew comes in a 12 oz. bottle and it has an ABV of 5.0%. It poured a very, very dark brown color with highlights of crimson around the edges and bottom of the pint glass. The tan colored head was of adequate size, smooth, creamy and soft. The retention time was ok and the lacing was not at all horrible, however it didn’t stick around too long either. The nose brought forth plenty of dark, toasted malts and breads. A slight hint of smoke was found as well. Light, dry cocoa powder and bakers chocolate revealed some sweetness while a significant amount of coffee and espresso seemed to be a bit more forceful than any other fragrance. The taste was much the same. Dry, chalky cocoa powder intermingled with toasted breads and barley. Quite a bit of coffee and espresso notes were accounted for, which sort of overtook the chocolate. The taste seemed to be more bitter than sweet I thought also. Not that that’s a bad thing, but just a little surprising considering the style. The mouthfeel was medium bodied. Very smooth, dry and chalky. The carbonation level was low to medium and an ok amount of flavor was left behind on the palate after each sip. Well, this beer was decent I guess. I wish I had more to say, but I just didn’t think it was all that complicated or complex. The beer is not bad by any means, but it just doesn’t quite hold up to some of the other Chocolate Stouts that are out there. The coffee/espresso notes seem to be a little too forward for the style. I don’t know, it could have just been me. It is a fairly easy drink however. Worth a try if you see it, but I wouldn’t travel all that far out of my way to obtain a bottle. Have you guys ever tried the Bison Organic Chocolate Stout? What did you think? Be sure to leave a comment and tell me all about it. Thanks for checking in on another review guys. I appreciate it.